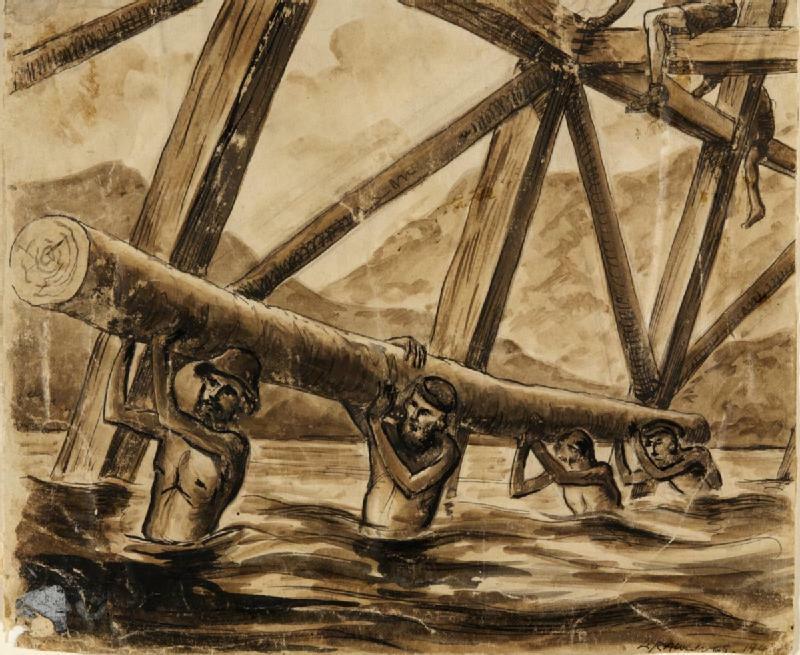 Bridge over the River Kwai, 1943. Artist: Rawlings, Leo. Image courtesy of Wikimedia Commons. Following the successful surprise attack on Pearl Harbor, the Japanese Imperial forces launched a series of campaigns to expand their influence and grab strategic points across China and the islands of the Pacific. In early 1942 the Imperial forces led an invasion of the island of Java, then part of the Dutch East Indies. The American-British-Dutch-Australian Command, ABDACOM (try saying that 3 times fast), mounted an unsuccessful attempt to defend against the invasion. To defend the sea lanes against the invasion the ABDACOM assembled a fleet of 2 heavy cruisers, 3 light cruisers , and 9 destroyers which meet a Japanese fleet of 2 heavy cruisers, 2 light cruisers, and 14 destroyers in the battle of the Java Sea. The Allies suffered a crushing defeat losing two light cruisers and three destroyers while only sinking 1 Japanese destroyer. After the battle the heavy cruiser USS Houston and light cruiser HMAS Perth were sent to Tjilatap for refueling and resupply of ammunition by way of the Sunda Strait. The allied ships were under the impression that friendly corvettes were patrolling the straight keeping it free of enemy ships. Unfortunately during the night of February 28 they ran into a larger Japanese invasion force of 2 heavy cruisers, 1 light cruiser, 9 destroyers, and 50 transports. At first the Perth signaled one of the Japanese destroyers assuming it was one of the friendly corvettes. But when the ship fired on them, the Perth and the Houston moved to engage. After an hour or so of fierce night fighting the Houston and Perth were both sunk. Only 368 out of a crew of over a thousand were saved from the Houston and 307 out of over 600 were saved from the Perth. But reports of the survivors would have to wait until they were rescued from Japanese prison camps in 1944. Come join us on February 28 for a special film screening of The Bridge on the River Kwai with an introduction from Captain Jay Thomas, US Naval History and Heritage Command. Then on March 2 join us for a lecture with Captain Thomas on the preservation of the site where the Houston and the Perth lay. You can also read more about the current state of the ships here.